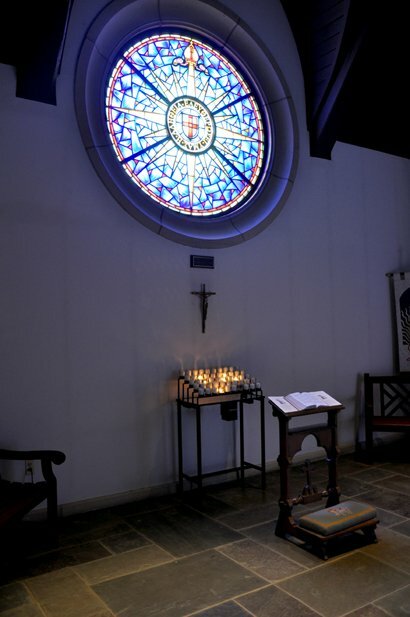 The rose window in the new Narthex was given by the Caputo family in memory Richard Phillip Caputo, after his death in September 1997. In discussing appropriate memorial possibilities with Father Malm and the Vestry, the idea of a rose window to replace the clear glass temporary window was suggested. Actually, several design possibilities were put forward but Father Malm’s suggestion of a compass rose to symbolize the Anglican Communion won the day. The Willet Stained Glass Studios in Philadelphia were selected to provide the design and installation, primarily because they were the creators of the original stained glass windows in the nave, choir loft and other parts of Grace.